The Supreme Court on Tuesday agreed to a hear a petition seeking a direction to the authorities to ensure that physical access to the Electronic Voting Machines (EVMs) is limited only to authorised engineers of Electronics Corporation of India Limited (ECIL) and Bharat Electronics Limited (BEL). While ECIL manufactures EVMs, BEL undertakes the upkeep and maintenance of EVMs during elections. The Bench comprising Justice AK Sikri and Justice Ashok Bhushan, while not issuing notice yet, directed the petitioner, Uttarakhand based journalist Ashish Goyal, to serve the copy on the counsel for Election Commission of India (ECI). The matter has been posted for further hearing after two weeks. The petition draws the Court’s attention to a report released in September 2006 by the Expert Committee for the Technical Evaluation of the Upgraded Electronic Voting Machine. 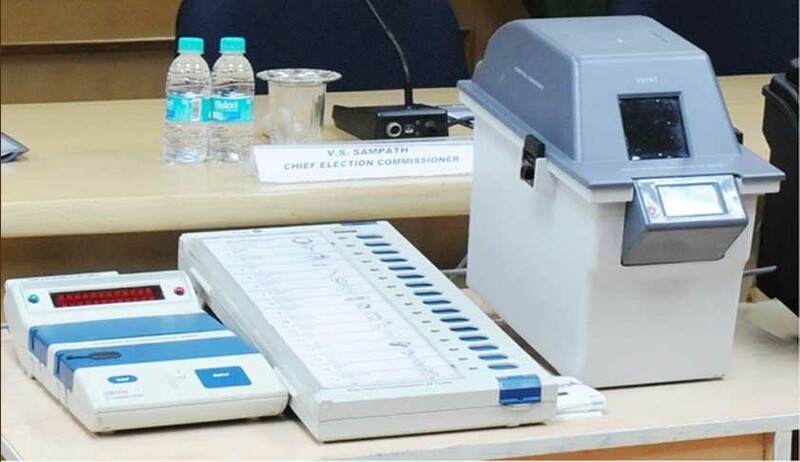 The report had while approving the upgraded EVMs, acknowledged the possibility of their tampering by introducing an activated “Trojan horse” sub-program through physical replacement by a tainted microchip. It further relies on a manual on Electronic Voting Machine issued in January 2017, which provides that the First Level Checking (FLV) of the EVMs should be carried out only by authorized engineers of ECIL and BEL. The petition then refers to the General Assembly elections that took place in Uttarakhand on 11 March 2017, claiming that post-election, the officials moved all the used EVMs to a different store when the counting had finished, without intimating the concerned political parties or their respective candidates. This, it said, was done in violation of the standard protocol that EVMs used in an election are to remain untouched for 45 days. RTI requests had further revealed that the consultants engaged in the Uttarakhand General Elections, 2017 belonged to an external manpower supply agency. Direction to the ECI to ensure that physical access to the EVMs is limited only to the authorized engineers of ECIL and BEL, and only after this personnel obtain security clearances. Direction to the ECI to provide the list of such authorized engineers to the contesting political parties as well as publish the list on its website well before the scheduled dates for the first level checking of EVMs. Direction to the ECI to implement the recommendations contained in Chapter 6 under the headings Design Change and Pre-poll, During-poll and post-poll precautions of the Report of the Expert Committee for the Technical Evaluation of EVMs released in September 2006. Direction for setting up a High Powered Committee headed by a retired Supreme Court judge to look into whether private personnel have been permitted access to handle EVMs in breach of the Manual on Electronic Voting Machine and VVPAT, 2017 since the assembly elections held from 2014. This committee would also conduct a formal enquiry into the antecedents of the additional private persons who were granted physical access to the EVMs during the Uttarakhand General Assembly Elections, 2017. Direction to the respondents to place on their respective websites exact number of EVMs which have been manufactured by ECIL and BEL, as also the exact number of EVMs which have been handed over to ECI and those which are currently in use in the country.